Repost from Houzz.com. Find the original article here. 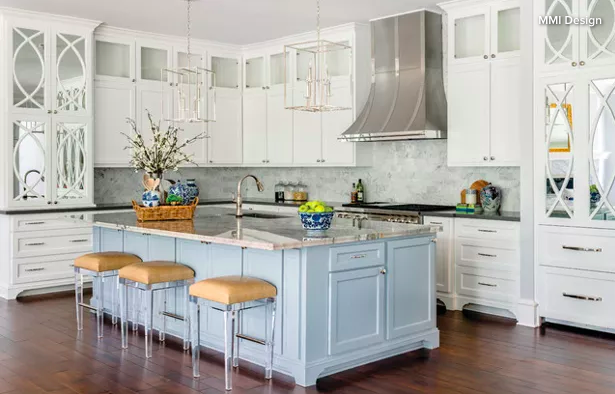 See the materials and other design elements that put these kitchens into a league of their own. Elegant features. Mullioned cabinets with mirror panels. Large-scale island pendants in polished nickel. Large range hood of stainless steel and chrome. Light blue island (Cobblestone Path by Benjamin Moore) topped with a Fantasy Macaubas quartzite countertop. Polished-nickel cabinet hardware and faucet. Carrara marble subway tile backsplash that extends behind the range to the ceiling. Dark wood floors. “The color scheme of blue, white and gray also created a beautiful foundation for the chinoiserie accents so loved by the client,” Merz says. Other special features. Dark schist perimeter countertops. Brass-and-black stools and light fixtures. Accent tile behind range is Calacatta, Thassos and bluestone marble, surrounded by a brass strip. Wide-plank French oak floors. “They were slightly wire-brushed for a little distressing and a lot of variation,” Vroom says. Elegant features. Tall ceilings covered in tongue-and-groove pine wood stained dark (Pecan by Sherwin-Williams). Douglas fir beams also stained dark (Brazilnut by Sherwin-Williams). Stain-grade knotty alder wood cabinets and island, also in Pecan stain. Porcelain backsplash tile with marble look. Quartz countertop with marble look. Cast-stone vent hood. Oversize island pendants.